ATS can supply a comprehensive range of electro-chemical sensors for both laboratory and industrial applications. Products include pH and reference electrodes, steam sterilisable and autoclavable pH electrodes, metal (ORP) electrodes, conductivity cells, ion selective electrodes and dissolved oxygen probes. Sensors can be supplied with a wide range of cables and connectors, for direct connection to all types of instruments. 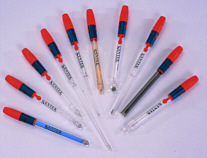 A wide range of sensors is available for use in industrial applications, where compatibility with in-line housings supplied by ABB, Endress &Hauser and other companies is important.Also offered is a comprehensive range of pH buffers, conductivity standards, ISE standard calibration solutions, ionic strength adjustment buffers and various electrode filling, cleaning and storage solutions.